Canada led from the first minute of the game and had a comfortable 4-0 lead after the first period. "You want to get momentum. I thought it was good to get the first one and get some momentum there early," Crosby said. "Once we get a fairly solid lead, I think they are not as motivated in the third. When the lead is big, it's a little tougher that way. I think that the way we played in the first, coming after them, it was a way we need to play. You gave up some chances, me personally, I made some mistakes there in the second and third that you don't want to make in a closer game. But I thought our start was something we wanted to improve on and we did a good job at that today." Crosby is appearing in his second World Championship, and in each instance he will make it to the medal round. As an 18-year-old in Latvia in 2006, he became the youngest player ever to win a Worlds scoring title with 16 points in nine games, but Canada lost in the semifinals against Sweden and in the bronze-medal game against Finland. Canada won gold the following year in Moscow and advanced to the finals on home ice in 2008 and in Switzerland 2009, but each time it was without Crosby, who went to the Stanley Cup Final with the Pittsburgh Penguins in 2008 and won the Stanley Cup a year later. This Saturday, Crosby will have his second chance to get to the World Championship final game and join the Triple Gold Club for players who have won the Stanley Cup, Olympic gold and the Worlds. There are 25 who have won all three titles, and eight of them are from Canada: Rob Blake, Joe Sakic, Brendan Shanahan, Scott Niedermayer, Chris Pronger, Eric Staal, Jonathan Toews and Patrice Bergeron. Detroit Red Wings coach Mike Babcock has also won all three. "That'd be great," Crosby said about winning the ongoing tournament. "There are some guys who've been close. I know [Jason Spezza] has been in a couple of (World Championship) finals and came up short, so it's not easy to do that. Obviously, we have to worry about the next one first. I just focus on trying to get to the finals and give ourselves the opportunity, but some guys have been in the situation before and we want to make sure we get the result we want." Canada will meet the Czech Republic in the semifinals. 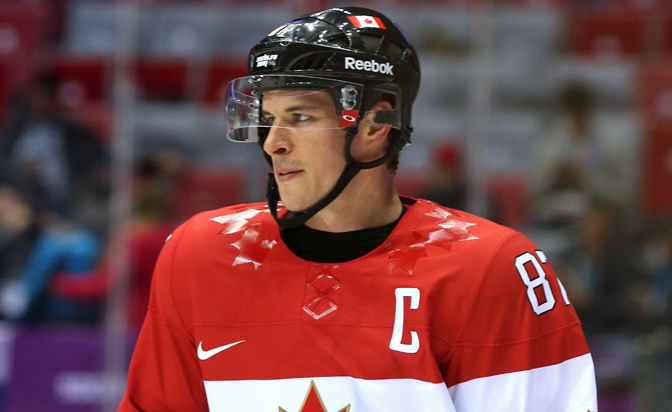 Despite scoring three goals and eight points in seven games at this year's Worlds, Crosby is well behind the tournament's scoring leaders, Spezza (13 points) and the Edmonton Oilers tandem of Taylor Hall and Jordan Eberle (11 points apiece). But for the captain, much more important is the fact the entire team stuck together well and has improved throughout the event. "The main thing is to raise your level of play with the games and that gets more and more important now. I think everybody is contributing, everyone has found a way to chip in and that's what we need if we want to win," Crosby said. The Penguins superstar is enjoying his time off the ice in Prague, one of the world's most scenic cities, where Canada won gold last time the Worlds were here in 2004. Crosby went to have dinner with his teammates on the boat on the Vltava River and enjoyed matinees with other players around the table tennis table in the hotel. He's had a big supporter in his father, who got a special pass from the organizers that allowed him to enter the Canadian locker room after each game. Crosby is enjoying his time on the ice too, as Canada won all seven of its preliminary-round games while scoring 49 goals. Their 58 total after Thursday represent the most during one World Championship since the Soviet era in the 1970s. But the biggest star of this year's tournament doesn't want to look at what happened in the past. He knows the final games of the tournament on Saturday and Sunday will be much more important. "It's a game at a time, really," Crosby said. "We definitely have a lot of different guys who can score, our 'D' have shown that they can score too. That helps when your back end is able to contribute offensively. I think the depth and being able to depend on different guys in different nights is important and we've done a good job with that."